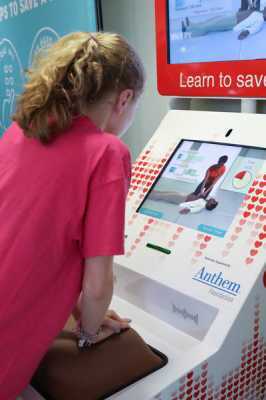 Response: All the kids were so receptive and were able to perform basic CPR and call for help. Only 37 states passed the bill to teach CPR by 12th grade. Teaching kids earlier and reinforcing these skills will lead to many lives saved. Response: We can look at rates of bystander CPR by state and see if there are better outcomes in the states where people are taught CPR starting in school. This entry was posted in Author Interviews, Education, Heart Disease, Pediatrics and tagged AHA17, cardiology, CPR, education, heart disease by Marie Benz MD FAAD. Bookmark the permalink.